Think of winterizing your boat like a hibernation. Your boat is going to take a little nap over the winter, but it still needs to be protected from the season's elements. 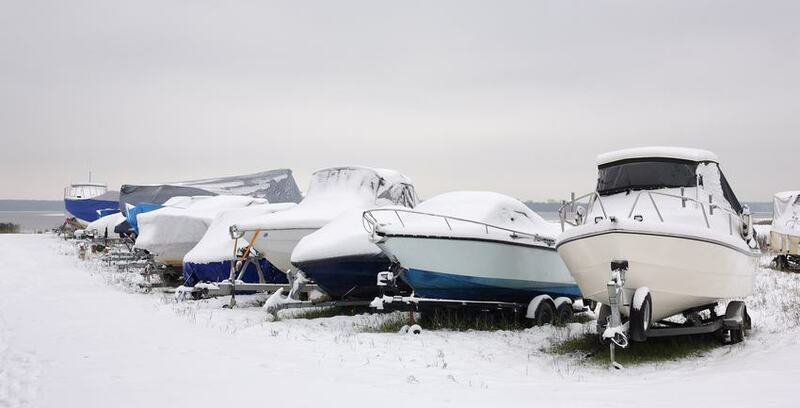 After all, cold weather can wreak havoc on a boat that is not properly prepared. Through our years in the self storage industry, the staff at Climate Storage has seen it all. So we thought it might be helpful to put together a list of things for our Knoxville boat owners to do as they prepare their boats for the hibernation that's soon to come. Check the hull, looking for stress cracks (common around the bow eye) and gelcoat blisters. Stress cracks can indicate structural damage, and anything serious should be looked at by a professional. Remove any unwanted guests such as barnacles. You may want to use a sander for finer particles. A good pressure washing never hurts, either. Winter air can be humid or dry, and both conditions can be harmful to vinyl interiors. So you'll want to use a vinyl protector to prevent your vinyl from drying out and cracking. But you also need to guard against moisture by using mildew sprays and by venting your boat cover. Next, if possible, remove electronics and let them spend their winter in a warmer environment. Also, spray all exposed electrical connections with a moisture-displacing lubricant. If your boat has a removable head, clean and dry it before you store it. Built-in units, including sinks and showers, should be drained and pumped with antifreeze. It's best to cover your boat and we recommend polyvinyl covers. They'll provide maximum water repellency and therefore provide a high level of protection against mildew and stains. Be sure the cover is securely tied down or taped so wind won’t get underneath the cover, blowing in snow or shredding the cover itself. Shrink wrap is another alternative to cover your boat. When installed correctly, your boat won’t be subject to heavy snows or falling objects that could otherwise dislodge a tarp. Winter’s biggest dangers to engines are freezing, corrosion and fuel degradation. Pull the engine cover and check for such problems as frayed or loose wires, connections and clamps. Check the condition of all hoses and replace those that are mushy or show cracks. Check the condition of the belts and adjust the tension if necessary. Touch up any paint nicks to prevent corrosion. Run the engine up to temperature and change the oil and filter. Flush the engine with fresh water. Even a small amount of water left in the engine can freeze and cause big damage. Inboards and sterndrives require refilling with propylene glycol antifreeze to prevent small ice pockets from forming, which can crack the block. Gasoline breaks down in storage -- the lighter factions evaporating and the heavier ones forming a jet-clogging and injector-sticking varnish. The degrading action can begin in as little as two weeks, and the fuel’s octane rating decreases in the process. Add fuel stabilizer to the tank and idle the engine for 10 to 20 minutes to distribute stabilizer throughout the system. If you’re conscientious about winter maintenance, your reward will be a quick launch in the spring when the hibernation finally comes to an end. If you need help storing your boat this winter, be sure to give us a call at 865-444-0919. One of our stroage professionals will be glad to help you.